Hi guys and gals! I feel so sorry for my poor neglected bloggo. It's been a VERY busy Summer. The last of this years hay was put up today, we've still got new chicks everywhere, and my little duck is doing great. I do believe he's a boy and I've decided to name him.....drumroll please....Bubby Quackers. 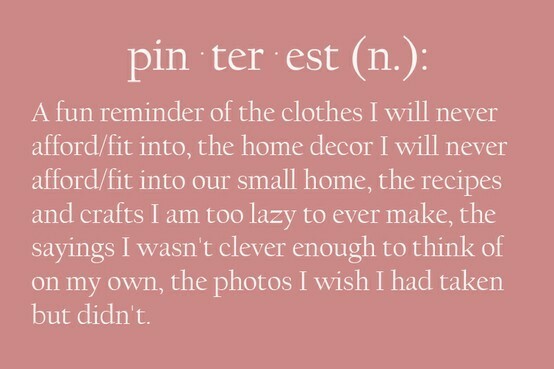 Love the definition! So true! 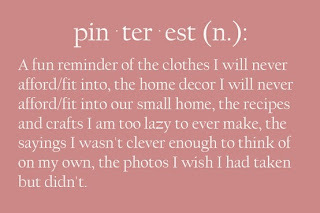 When I'm pinning I want to run to my craft room and make something or run to the kitchen and cook. It's nice to get soooo inspired! My preciously cute Gracie Goble! Love this little fat fluff ball dearly! 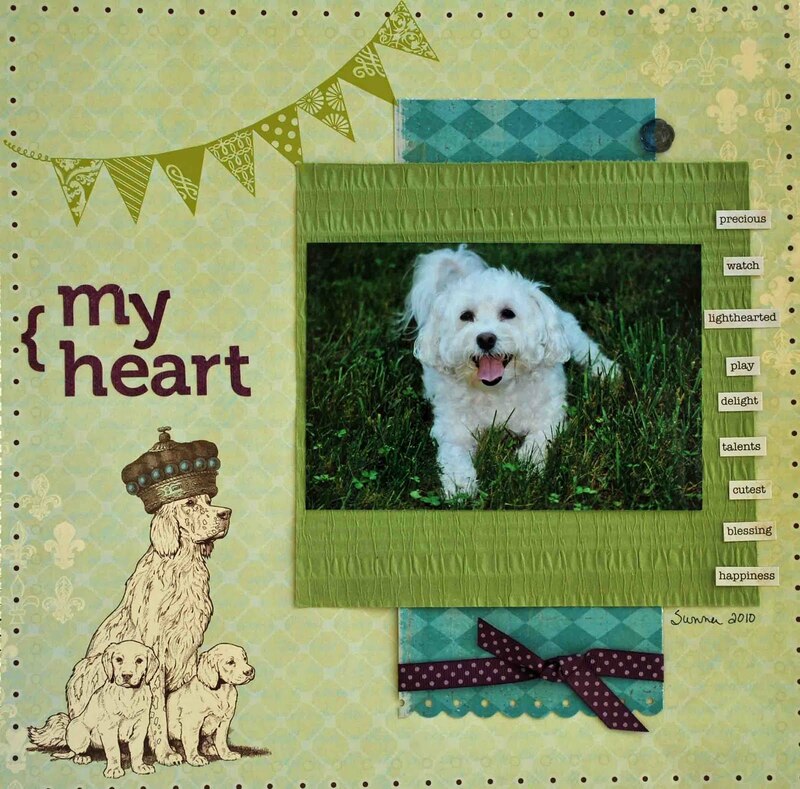 This darling Webster's Pages paper was perfect for my doggie theme. I also adore the Hambley Banner rub-on. Visit The Sampler today to get your kit. I also have a mini album tutorial at The Sampler's new blog, so stop by! And Holly from Experience Life Wisely is having a giveaway at her blog, just follow the link for your chance to win! Logan wanted to go fishing while we were on vacation. People all around us were catching baby sharks. He threw his line in and a few minutes later he had a bite, a shark! Definitely a memory he will always have. Matt and I had run out shopping, so Logan insisted on waiting till I got back to go fishing so I'd have my camera ready, hehe! He knows me well! 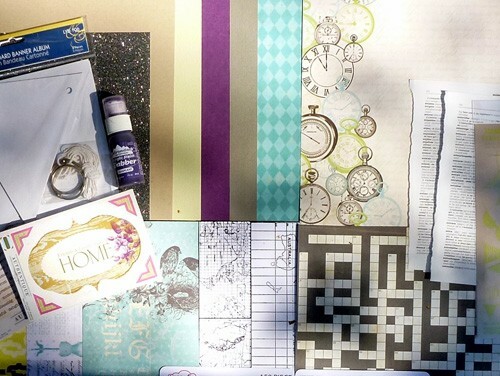 I loved the July Sampler Kit, it had all kinds of goodies perfect for Summer scrapping. The Sampler Kit Club also has a new Typepad blog where you can keep up with the latest news, we'd love for you to become a follower! 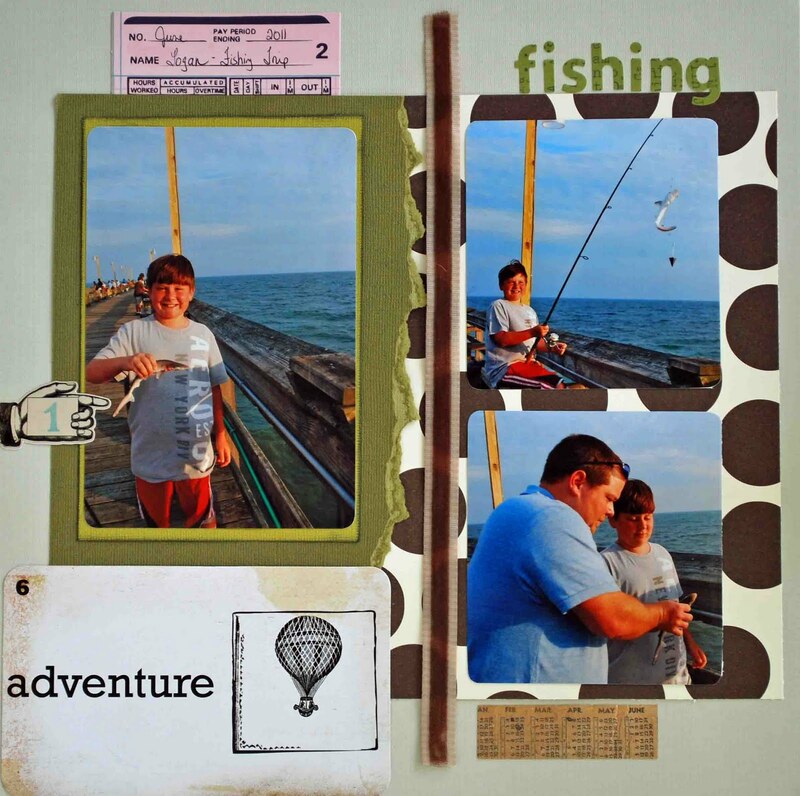 There is a fabulous Scrapbook Superstore there that I love. We shopped till we almost dropped! 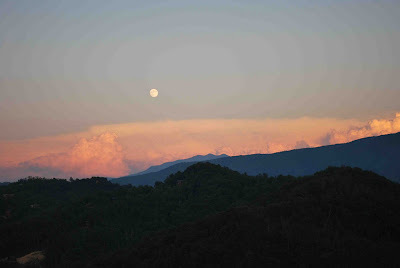 I'm thankful God gave me such a great peaceful week relaxing with nothing to do! 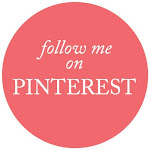 Hi guys and my poor little neglected blog! Seems like my mojo has took a Summer vacation and hasn't came home yet! There's just endless work to do on the farm plus I do have a REAL job that pays the bills. Hopefully with Autumn around the corner I can slow down and enjoy days snuggled indoors scrapping and crafting. 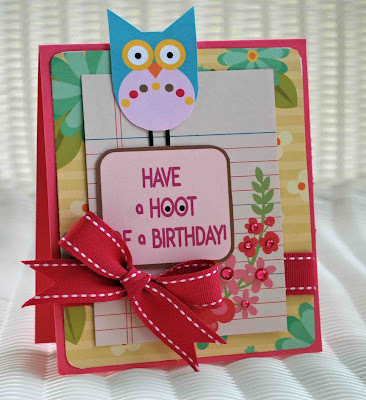 I have 2 cards to share with you tonite using adorable digital clipart from One Pink Lemon. 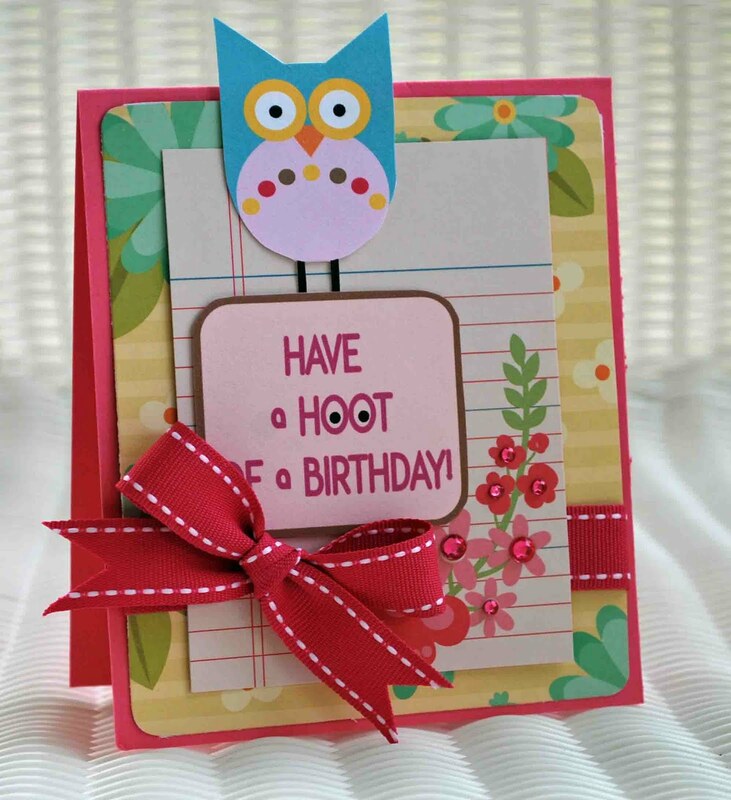 First up is a "hoot" of a card. I can't get enough owls! Who would think they'd be so cute on paper. Up next is another card using goodies from One Pink Lemon. This time I used the Home Sweet Home digital clipart set. 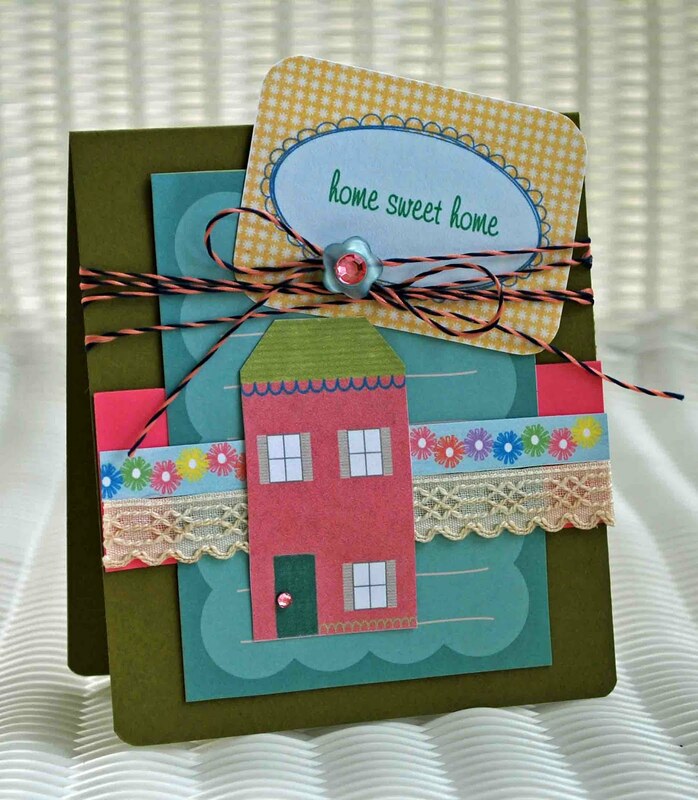 For this little card I used PTI Cardstock. Patterned Paper is My Little Shoebox. Twine and seam binding. Button is Crate Paper and bling is Creative Charms. My house, sentiment, and flower border are One Pink Lemon. This is my little barn. It's where I keep my chickens and turkeys. 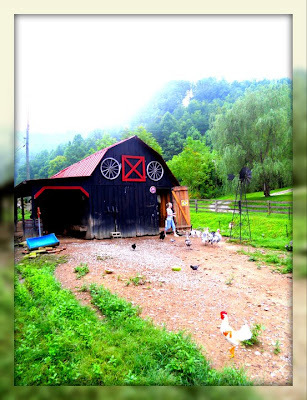 I adore my little barn - this is the most peaceful place on the planet and I could sit there for hours and watch my chickens interact with eachother. That's me surrounded by chicks and turkeys! They were preparing for a midday snack of corn. My neighbor gave me a Silkie rooster today. We're thinking all of the Silkies I hatched are females so we needed a rooster. My new rooster has a history of picking fights and being a bully, so we named him Ivan the Terrible. Hopefully he will prove his name wrong and fit in perfectly! And hopefully we'll start having baby Silkies!